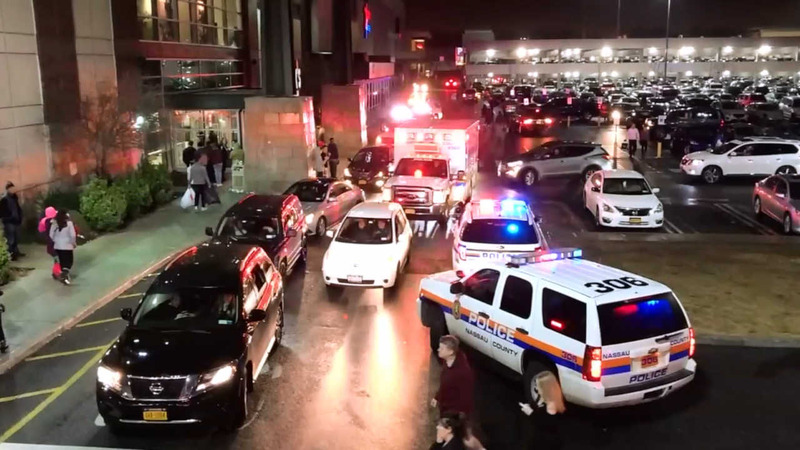 GARDEN CITY, Long Island (WABC) -- Police responded to a mall scare at Roosevelt Field on Long Island Monday evening. Officers say a large fight broke out just before 7 p.m., causing a chaotic scene at the mall's food court. There were rumors of a shooting, but police say no shots were fired. Authorities believe the chaotic atmosphere prompted many 911 callers to falsely report gunfire. Officials say they received 70 calls. The scene was under control when officers arrived, but they say 7 people suffered minor injuries during the melee. A man was arrested in the same mall three days before Christmas last year when a gun he was holding during a robbery attempt fired as he struggled with a security guard. A bystander was shot during that incident. Earlier in the day, chaos and panic erupted at a mall in New Jersey after a gunshot-like noise was heard.